A Document Management System (DMS module): a XML Authoring Tool for the generation and change control of the Information Set based on S1000D Data Modules. 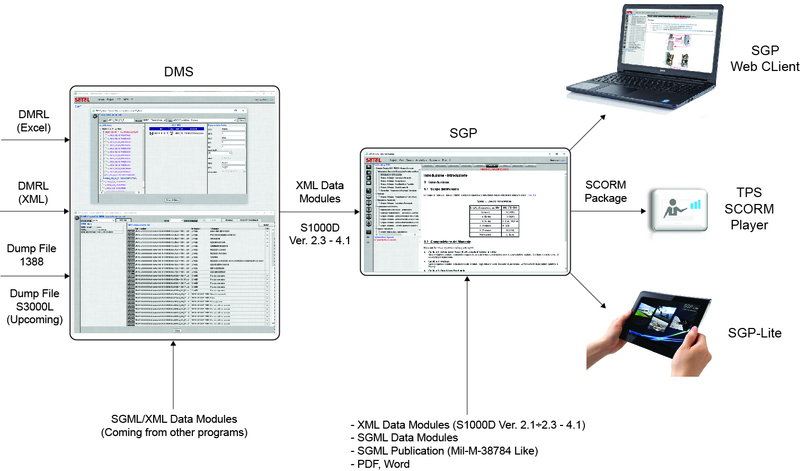 An Interactive Publications Management System (SGP module): a XML Publishing Tool for the visualization and configuration management of the Interactive Electronic Technical Manuals. An Off-line Browsing Tool (SGP-Lite module): providing off-line fruition of produced IETM on Mobile Devices (Tablets, Smartphone) or Stand-alone PC. A TPS Player: providing off‐line fruition of produced Training Modules (SCORM compliant) generated by TPS. The TPS architecture is based on Windows Operating System (XP Pro, Windows 7 or Windows 8), Mysql Server Data Base and IIS Web Server. The Apps. for the IETM fruition on Tablets are developed for iOS, Android and Windows 8 environments. The Document Management System is a tool providing functions for creating, managing and publishing of Interactive Electronic Technical Manuals (IETM). The software platform is aimed to efficiently manage the evolution of electronics technical manuals of any User. The Publishing Environment is dedicated to the generation of IETM and/or Training Documentation. The Interactive Publications Management System (SGP) is a XML Publishing Tool for the visualization and configuration management of Interactive Electronic Technical Manuals (IETM). The Browsing Environment is intended for IETP consulting. is an advanced application that allows to manage and consult documentation and technical content (produced according to the standard S1000D ver. 2.3 – 4.1) by using a Tablet (IpaD™, Android™, Windows™ 8) and other mobile devices (i.e. Smartphone).